Downstairs there’s a neighborhood grocery - the proper kind with a Scooby-Doo-style van outside, fruit, veggies, sandwiches, and PB&Js inside (yes, PB&Js you would choose to pay for). Upstairs, you won’t find Fred and Daphne, but you will find the Hoffman family. Mom, Kelly, Dad, Lee, 2-year-old Tallulah and their 95 pound golden retriever, Bear. Walk up the narrow staircase to a landing that opens out to their second floor home situated in the Duboce Triangle. It's a circular space that encompasses one bathroom, one bedroom, a living area with master bed alcove, and the kitchen. It makes sense for Tallulah to have the bedroom. Those all important walls and a door (seriously sought after assets in SF) allowing Kelly and Lee to go about their evening after toddler bedtime. Plus, the room doubles as a play zone, leaving the living areas free from being overrun with toys. The bookshelves that ladder up Tallulah’s bedroom wall are simple IKEA spice racks. Sized perfectly to hold jars of oregano, or picture books it turns out. And every inch of closet space in the room is capitalized on to contain all of the family’s clothes, not just Miss T.
When Kelly and Lee gave up their bedroom to give Tallulah her own space, they managed to find their own in what was previously the dining alcove - now converted into an open master room. This little sun trap neatly fits their queen bed (winning), lending the feeling of a second bedroom to their one bedder. In the living room, the clever use of a high coffee table - a play desk from the Land of Nod - adds another layer of multi-functionality to the room. The table performs as a dining table, coffee table, or play table depending on the time of the day. Kelly keeps an oilcloth underneath to cover the table up for art projects and the like. The couch is from IKEA and is sectional so it comes apart in pieces - essential since the first model they bought wouldn't fit up their narrow staircase. The kitchen has been updated through the years with new paint and new door handles on the cabinetry to keep it fresh. Kelly and Lee also added the freestanding counter space, a kitchen island from IKEA that acts as a necessary countertop. Stools convert that counter into a dining table or breakfast bar as needed. Although with Tallulah out of the high chair now, they tend to eat more in the living room. It’s an apartment that Kelly and Lee have adapted as their needs as a family changed. They got engaged on the roof, and had their first child while living there. After Tallulah was born they assumed they would move out when she was around six months. The San Francisco rental market had other ideas, but luckily so did they. Moving their bed into what was once their dining room gave them the breathing room they needed to make it work a little while longer. Note: The interview that this article is based on took place in mid 2016. From the street the Shaw/Rauch family home mirrors the victorians typical of their Mission neighborhood. However, pass through the main house and you are presented with something unexpected. A modern cottage at the end of a garden. It is this little hideaway in the middle of the city that Dav, Kate and their two boys have called home for the past year. Townes (5), greets us at the door. He has been playing Monopoly by himself and is eager to let us know the status of his imaginary opponent. We take off our shoes on the deck and walk inside. Sofas in the living space convert to the boys' beds at night. Lego organisation is answered here with large clear storage boxes. At just over 600 square feet spread over two floors, most of the house is on display as soon as you enter. The downstairs is comprised of one large room encompassing the kitchen, living and dining areas. Part of this space also converts into the boys’ bedroom at night. Upstairs, a mezzanine level hosts the master bedroom and the bathroom, which holds the distinction of being the only walled room in the building. The dining area and entrance to the cottage. The open plan nature of the home has allowed Dav and Kate to take advantage of every square foot available. There are clever and thoughtful uses of every surface and nook. Storage built into walls and under the stairs, skylights to illuminate and open the space, underfloor heating, and multipurpose furniture such as the daybed and sofa downstairs that convert into the two boys’ beds at night. A functional kitchen, overseen by Lego projects. Bench space is at a premium, but the coffee machine makes the cut. When Dav and Kate purchased this property in 2012 there was little more than a shack standing in the place of their now tiny home. When putting together paperwork for planning permissions they poured over old Sanborn maps and other documents. Their research gave them evidence of prior residency, which helped them to gain their permission. Even so, the drawn-out process still took around two years. Storage under the stairs was made possible by moving the water heaters to a pop-out closet outside. The construction of the building took longer than initially expected, largely due to the fact that the city required it to be a renovation rather than a new build. An edict that made their lives more difficult during the planning and construction process, but one that they are ultimately happy with. Now that the renovations are complete, they have a modern cottage that retains the shape and character of the original structure. The roofline, and upstairs the arch window and french doors that look out over the yard and leafy trees. They appreciate that in this way the integrity of historical buildings are preserved in the city. Silas (8) is cutting up some mango on the dining table. When asked what he thinks of life in the cottage, he echoes Kate’s statement, replying “...Cramped”. Though next he acknowledges the togetherness that they have felt as a family unit. It’s easy to communicate with each other when you are all within a few feet. He also enjoys how warm it is, underfloor heating and new walls and windows make for a cozy space. Dav, Kate, Townes, and Silas. For Townes, their gregarious youngest child and resident extrovert, living in such close quarters has been enjoyable. This is true for his dad too, “It’s actually been a really wonderful experience, I thought we’d be killing each other, but I quite like it. Except for those moments where I really need to do work,” says Dav. Some challenges have mostly been overcome with the help of creative solutions or a little rearranging. Dav and Kate have utilized their deck and outdoor space to allow for entertaining more friends than can comfortably fit inside. An outdoor dining table on the deck, grill, and a fire pit in the yard creates a warm convivial atmosphere. And when the kids need to go to bed, the adults can keep chatting outside without too much disruption. Little things have made big differences to daily life. Take the large red trunks that sit outside on either side of the front door. These hold all of the family’s shoes. With the footwear stored outside, closet space is maximized inside, freeing up limited clothes storage. Other details, like recessing the toilet cistern into the wall when building the bathroom have all helped to take advantage of the space available to them and make daily living a little easier. Red storage boxes house the family shoe collection punctuate their outdoor space - a welcome extension to their living area. On reflection they’ve learned a lot about how they live from their experience, “...the big takeaway for me from living here is that you don’t need as much stuff as you think you do... I’ve really liked the exercise of packing up everything and putting it all in storage and discovering that we really need very little. That was kind of liberating,” says Kate. She summarises the feelings that have come to a surface as a family of four in a tiny home, “There’s more cosiness, there’s more love and there’s more tension and there’s more fighting. I think everything just gets a little bit more amplified. More intimate, and all of the stuff that comes with being more intimate,” says Kate. What do you get when a Swedish designer-turned-caterer has a baby with a Bay Area fabricator-slash-woodworker? Custom built shelves, one-of-a kind mobiles, and a cut-to-size diaper station. All put together with a Scandinavian eye and a Californian sensibility. Emmet and Dylan have created a home for their family in a one bedroom apartment in the Precita Park neighborhood of San Francisco. Dylan is the founder of Skiff, a fabrication and design company, while Emmet is the proud owner of Mumsa, a fully organic and vegetarian program for preschool students. When their daughter Alma arrived circa six months ago, they made a few changes, but weren’t concerned about a potential lack of space, “If anything it was more of a discussion on how to be able to raise a child in San Francisco” says Dylan. Having Alma sleep in their room rather than a separate nursery came naturally. Especially for Emmet who grew up in Sweden where apartment living is the norm. In general the couple’s philosophy when transforming their space for Alma was to go easy on the specialized baby goods. They aim to create a harmonious space, “living in a space that creates obstacles, even if they are very small, will inevitably bring you stress. Being a new parent, having less unnecessary stress is essential. So if you’re tripping on a cord every day, it probably doesn’t serve you to keep it there.” says Emmet. Alma plays in the clouds thanks to her handmade baby gym. The couple are fortunate with this apartment in that there is a ‘front room’. Commonly annexed as a second bedroom in this kind of rental market - theirs hasn’t met such a fate yet. Instead it acts as office and living room, while offering the flexibility to transform into Alma’s room as she grows into toddlerhood. Respective talents are well utilized in this room where the family spend most of their time. Along one wall is a custom made two person office desk. On the floor, a delightful wooden cloud play gym handmade by Emmet and Dylan in the final few days as they awaited Alma’s arrival. While across the room, what once was a disused doorway now features a custom built shelving unit. The pair have created space by building their storage into the room, and where possible, customizing to their needs as both small business owners and parents. Take the armchair that the couple converted into a rocker - it fits with their style and with a quick ‘hack’ to add the rocker feet, is an economical alternative to the rockers that currently dominate the nursery market. Leaving the front room, we pass through an extension of the living room space (playing host to more seating and a gorgeous credenza), on the way to the bedroom, kitchen, bathroom and out to the back garden. In the bedroom, Alma sleeps in an IKEA Singlar crib joined to Dylan and Emmet’s bed. Part makeshift co-sleeper, part full-size crib, it allows for everyone to sleep close and for easy feeding during the night. “It feels like we are sleeping on one giant bed as a family,” says Dylan. The colorful geometric mobile that hangs above was designed and made by Emmet. While a bookcase leaning against the wall is one of Dylan’s builds. Through into the kitchen, the apartment opens up to light bright space thanks to large windows that lead out to the back garden. The kitchen table, handmade by the couple, beautifully extends from the wall. While the familiar Stokke chair was salvaged from the street and given a lick of paint. Now it’s good as almost new and perfect for little Alma to begin her journey into the world of solids. Details dotted around the kitchen hark to another home far away: A bright felt artwork made by Emmet’s mom, a Swedish flag on the windowsill, a traditional calendar hanging in the hall. Though from two different parts of the globe, Emmet and Dylan particularly like their place in the world right now. Being so close to the Mission and all of their usual haunts, “we love our location, we’ve both been in the Mission for the past six years and many of our favourite spots are in and around here, so we walk a lot,” says Emmet. A typical Swedish calendar is a daily reminder of Emmet's roots. Alma needs a new diaper, so we head into the bathroom. Her changing station lives here, handily cut down to just the right size and installed by the couple. “We’re super happy with how it turned out, having an easy to use convenient changing table is a must”, notes Emmet. Further customization is abound. To modernize dated fittings, the couple removed and replaced all of the doors on the bathroom cabinets with custom made white washed pine panels. They also made two shelving boxes for the wall and a shelving fixture next to the sink. The family’s living space doesn’t stop here. They are lucky enough to also have a peep of the outdoors, a sweet patio spot on their back stairs and a small shared garden. Not to mention the very fabulous perk of the occasional use of an in-law unit. Thanks to a very gracious landlord, Emmet and Dylan can use this when family visits, such as Emmet’s mother from Sweden. Emmet, Dylan and Alma’s Precita Park home is a rare treat in this city. A one bedroom apartment with the kind of generous flexibility that should see them grow into the space, before they outgrow it. It would be unusual to walk down 24th street without passing a mom pushing a stroller, or a kid on a micro-mini, or a dad wearing an Ergo carrier. Most likely you will encounter all three, plus a Labradoodle. Noe Valley has a reputation for being the quintessential San Francisco family neighborhood. It is in the very heart of this most child friendly part of town that I meet the Whaley family. Two adults, two kids, two cats and a dog, perched above a rug shop in their cosy two bedroom apartment. The short climb up the shared stairs offers a fitting preview to the Whaley’s small space. A cast of items have found strategic homes in wall recesses and behind window-wells. From strollers, to bikes, to toys that have fallen out of favour; the stairwell alone is a well executed project in reclaimed land. Once at the top of the stairs, the Whaley’s front door opens to a hallway full of original character details. Built into the wall on one side is a charming telephone niche with custom fold down stool, and across the hall, a WC featuring a light well and decorated with old subway tiles. It also features a custom built shallow shelf that allows for bathroom tissue rolls to be stacked high, tidy and out of the way. Continuing down to the end of the hall, the main living area of the apartment opens up, revealing the kitchen, living room and dining zones. Off this space, the two bedrooms and a private terrace patio can be accessed. Grayson, the boisterous two and a half-year-old, takes a moment to introduce the family dog. He jumps excitedly with one arm outstretched to keep a treat out of reach until Ranger has ‘sat’. Next he bounds into his room. Grayson’s bedroom is kitted out with a toddler bed placed Montessori style on the floor, as well as a twin trundle bed. Tracie and Chris are particularly fond of the trundle, a feature that allows the room to easily transform into a guest room when family or friends visit, or an extra bed for dad to catch some Zs during the newborn nights. The boys clothes, toys, and baby items are given the rather lovely home of an original built-in china hutch, “we decorated it with wrapping paper and changed to draw pulls to get rid of the sharp edges,” Tracie explains. A side door that opens from Grayson’s bedroom reveals a small disused landing which has been expertly packed to the rafters - adding to the tetris-esque theme of extra storage in this apartment. In the living area, Tracie feeds four-month-old Beau on the sofa. Available wall space is well utilized in this room, with floor to ceiling shelving that Tracie and Chris sourced second hand. The shelves house everything from the television, to books, to a crate for their dog to sleep in at night. The lower shelves are kept kid friendly with toys and books, with harder to reach shelves hosting breakables and more precious things. Tracie recalls a sweet memory of how they arranged things back when Grayson was just starting to crawl, “we put a mirror down on the lowest shelves… he would crawl over and kiss himself.” Nowadays Grayson’s toybox and train set live at floor level below. Across in the kitchen, Chris makes a tea and keeps an eye on Grayson who is blowing bubbles on the patio. It’s a small kitchen and bench space is at a premium, but the family are able to utilize vertical planes by hanging utensils and storage baskets. They also organize drawers meticulously to take advantage of what storage is inbuilt. Over at the dining table sits a familiar sight, a well-loved Stokke high chair acquired from Craigslist. In the master bedroom, Tracie and Chris have accommodated the newest baby Whaley in a way that doesn’t take up a lot of space. They use an Arm’s Reach co-sleeper beside their bed as a bassinet, and choose to eschew the changing table. The couple extend this advice to others welcoming a baby into a small home, “skip getting a changing table… use a bed or couch instead combined with a changing pad,” says Chris. More storage is to be found in this bedroom in the form of drawers under the bed that house linen and clothing. A particularly treasured feature of this apartment is the private patio. With views out to Mt Sutro, it must be quite a treat to sit out on during the sunnier months. As is, even on one of San Francisco’s wetter winter days, Grayson is able to ride around on his trike accompanied by Ranger, enjoying the fresh air. The family cats also get a special home on the patio, a cat kennel type contraption to which Cinder and Sabine can retreat to escape the dog, or humans, or just to nap as cats generally like to do. As Grayson comes back inside, Chris lets Tracie know that he has downed the bubble liquid. Toddlers. The household is busy and bustling and with two under three, there is always something to do. That factor doesn’t necessarily get any more difficult in a smaller space, “there’s less space to make a mess and hence less places to clean,” said Chris. In fact, he is surprised at the ease of living with kids in smaller quarters, “you feel more connected as a family, yet with a two bedroom we always have room for our oldest son to play or read independently,” Chris adds. The location is a major factor in making this space work, “we walk to the store for our groceries, we walk to the parks… we love weekends when we don’t have plans that require the car and can just enjoy doing things like shopping and playing together,” says Tracie. Familiar faces abound, the Whaleys are mainstays in the neighborhood and enjoy their community immensely, “we can hardly go a block without running into someone we know - a neighbor, a shopkeeper, we’ve really developed a community here.” Tracie adds. Note: The interview for this piece took place just a few weeks before the Whaley family were due to move to their new home north of San Francisco. They were keen to share their experience living as a family in their cherished little Noe nest before leaving. We wish them success and happiness. And of course, a little extra leg room. Snack time for Hunter. A second hand Stokke high chair and small table at the wall allow for a dedicated eating space. I met Suzanne and her two young sons Hunter and Theoden in their studio apartment just a week before they moved out. Among the boxes and bustle of packing, the bones of family life in the apartment remained. 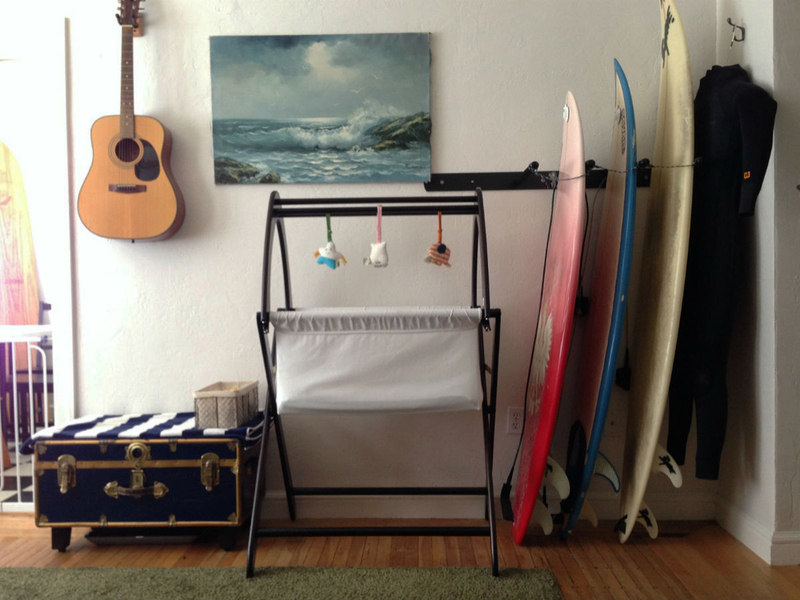 The hand-built loft bed suspended above the living space, the closet home to Hunter’s crib and rocking horse, baby Theoden’s bassinet, and a stack of surfboards (yes, full-sized surfboards). Packing boxes signal the end of the Kroleski's memorable time as a family in their 400 sq ft studio apartment. We chatted about family life in the apartment; the logistics of it all. Negotiating naptimes for two under two was a particular point of amazement and awe, not without its war stories. Mostly Suzanne wanted other families contemplating staying in studios to know that it can be done. Mom Suzanne, dad Greg, and sons Hunter and Theoden, successfully lived together in what is essentially one room - a studio apartment in San Francisco’s Western Addition. Here’s how they did it. Suzanne moved in with Greg and his ten or so surfboards after getting married in 2012. When their first son, Hunter, arrived couple of years later, they decided to stay put. Though not without reservations about welcoming another human into the space, “I was definitely apprehensive. How would we/he sleep? Where would he sleep?” said Suzanne. The beautiful Cariboo basinett, flanked by Greg's surfboards. // Photograph courtesy of Greg Kroleski. A new and considerably more ample challenge presented with the Kroleski’s second son’s arrival. Fitting two babies (Hunter was 14 months old when Theoden was born) into a space designed for a bachelor required a little more thought, resourcefulness and creativity. They could have moved, but their plans were complicated, and San Francisco rental prices are no joke, “we kept saying, 'we hope to move soon, but things are going well right now',” said Suzanne. Suzanne and Greg's loft bed was hand built to their needs and specifications. The bookcase acts as stairs. To prepare for Theoden’s arrival, Suzanne and Greg set to making some big changes in the space. With nowhere to go but up, they decided to head skyward. Greg built a loft bed, so that the master bed could be hoisted above the sofa and completely open up the space. “He learned as he went,” said Suzanne. They did their research online to assess what would work best for their needs, “we spent time searching the internet for photos of different types of lofts and ladders/staircases,” Suzanne added. Once the couple had an idea of what they wanted, Greg drew plans, measured, bought and cut the wood. He constructed their loft bed both in and outside their apartment - making use of the roomy sidewalks outside their building and San Francisco’s dry weather to work outside as much as possible. The finished product was a sturdy wooden loft, with a corresponding staircase that also functions as a bookshelf. Greg’s handywork worked remarkably well and freed up the bottom floor to be a living room for the family. To create a dedicated sleeping space for the then one-year-old, Hunter. They cleared out the closet and converted this into a nursery. Neatly fitting Hunter’s crib, changing table, rocking horse, clothing and other stored items. As for Theoden, like his big brother before him, a bassinet was placed in the living room to serve as his cozy bed for the first few months of his life. To further free up the space for two children, Suzanne and Greg also said goodbye to their piano (I assure you this is not a typo), and culled and sorted some more of their belongings. Hunter's nursery tucks neatly away into the closet. Fitting a full-sized crib, changing table, clothing and storage. Even with the logistics of where everyone sleeps under control, there are of course some question marks over just how that sleep goes down. As mentioned earlier, nap time is a particularly unforgiving beast in the small apartment experience. Though the age gap between Hunter and Theoden is only just over a year, they were at vastly different stages in their development while living in the studio. “How are you supposed to keep a toddler quiet while an infant sleeps?” remarked Suzanne. A difficult enough feat even when you have walls dividing the nappers from the rest of the household. Theoden surveys the world from his Baby Bjorn bouncer and bay window perch. Another noise issue presented in the form of balancing early morning work with sleeping babes. To help the boys sleep longer, Greg started taking those early business calls in the car (in the garage downstairs); the Living Small equivalent of a home office. With an active toddler and a newborn in tow, a yard or outdoor play area would have made life a little easier for Suzanne and Greg. However, they loved their Western Addition location. The proximity to quality local playgrounds and city amenities was invaluable in enabling them to enjoy their neighbourhood as an easy extension of their small abode, “I love that everything is within walking distance - the grocery store, our favorite burrito place, several fantastic parks, the pool, two libraries, and our church. It has been a privilege to live in such a beautiful, diverse city.” Suzanne explained. The studio's quintessential San Francisco street view. Not only did living in a small space help them to appreciate their surroundings, it also pushed them to look inward. There aren’t too many places to hide from each other when you’re perched on a loft bed above two sleeping kids. “(living here) brought Greg and I closer together, forcing us to realize that we’re on the same team… when you’re in a tight space, you can’t ignore each other, or issues that come up,” said Suzanne. Though the family were in the process of moving out when I stopped by, it was inspiring to meet and witness even a passing glimpse of their ingenuity and resourcefulness. A fully functioning home for a family of four. In a space with a floor plan the size of a pacifier. Yes it can be done, yes it has been done. “Everything just sort of fell into place. We were very thankful,” said Suzanne. For more about the lessons learned during family life in a studio, take a look at Greg’s personal blog post about the experience. 14-month-old Freja lets out a squeal as she spots a large labrador retriever being walked along the narrow street below. Perched on top of the sofa, Freja lights up at the sights and sounds that filter through her living room window. As with many city kids, Freja’s front yard is her neighborhood - The Mission, a bustling San Francisco zone with a changing face and a long history. In contrast, her back yard is home to two redwood trees, standing tall on a patch of earth that is now more accustomed to sprouting apartment blocks. This second floor apartment is home to Freja, mom Wendy, dad Brett, Flaca the Italian Greyhound and Natsu the cherished elderly cat. Wendy is a hair stylist and Brett works in corporate catering. They lead busy lives and have lived in this apartment for several years now. Wendy and Brett managed to create a nursery for their daughter in what was previously a small sunroom occupied by pet and household storage, “we had to purge a ton of albums that we've collected and rearrange the ones that we've kept. And also find new places for our pets food dishes and litter box,” said Wendy. With a little reorganisation, the tiny alcove space off the kitchen has become a living breathing nursery. Housing a mini crib, changing table, storage for baby items, and a whimsical monster-unicorn-head-trophy thing. It’s cute. The nursery works remarkably well for now. The mini crib fits perfectly, and a full-size crib or toddler bed could even replace it when Freja gets too big. The real challenge for Wendy and Brett is not the space itself, but the closeness of their surroundings. Noise transparency in particular. Freja eats a snack in her Ikea Antilop high chair. Loved by many parents for its simplicity of design and ease of cleaning, it's also only $20. In terms of the space itself, the kitchen has not seen huge changes since the arrival of Freja. With the exception of the high chair and a small wooden play oven. Despite the limited access, Wendy and family like to spend time in this room. The parents both enjoy cooking and Freja takes advantage of the floor space to move and play. What’s more, its view out the the redwoods is special for a city apartment (one of which they have dubbed ‘Freja’s tree’, as it lies directly outside her nursery window). An umbrella stroller like this Summer Infant 3D Lite is perfect for navigating stairs, then stowing indoors. Follow the aptly named dog, Flaca (skinny in Spanish), down the hall and the rest of the house unravels; revealing a bathroom, master bedroom and lastly the living room, adjacent to the front door. While the hall is not wasted space either, playing host to storage, art and Freja’s stroller, which stays folded neatly until the next outing. In the living room, Freja’s toys are mostly neatly stored away in a basket under the coffee table with the exception of a wooden activity center. It doesn’t feel cluttered or kids-y. There is ample art and personal pieces in the room that play homage to lives lived by a young couple. When Freja needs entertainment however, toys can be pulled out to transform the room into a play zone. So far, Wendy and Brett have enjoyed family life in the apartment, “we've been pleasantly surprised at how well we've been able to live with less,” said Wendy. Beyond the sound transparency issue, the biggest challenge has come from storage. Or lack thereof, “it's been interesting trying to fit things in every other nook and cranny that we can come up with. Our closets and drawers are packed and there's no wiggle room under our bed,” Wendy adds. The couple try to keep on top of what is being used, what isn’t, and to purge the superfluous items. Bulky things that Freja used in earlier stages of her development, such as their cherished Bednest bassinet, or baby toys like a jumper and walker, have already been moved on. The family are in a constant state of give and take. And this adaptability is how the Newsome-Campbells are making it work in their small apartment; crafting a home for themselves out of, and with respect to, their urban environment. It’s an unusually hot day, the sun is beating down on the concrete pavement squares. I’m greeted by Matteo Clivati and his daughter, Anna (16 months), outside of their apartment block. With Anna in his arms, Matteo is eager to get back inside and cool down. The Clivatis live in a one bedroom apartment in the Marina neighbourhood of San Francisco. For those who aren’t familiar, the Marina is separated from the rest of the city by a steep hill. Situated beside the bay, it looks out towards San Francisco icons like the Golden Gate bridge and Alcatraz. Inside the apartment we meet Sarah, Matteo’s wife. Sarah is originally from Texas and works in media, while Matteo is a chef from Milan. They met in 2012 when Sarah took a year off to work in a bed and breakfast in Lake Como where Matteo catered an event. Now three years later, they find themselves married with a 16-month-old and living in another beautiful part of the world. One that just so happens to also be home to some of the world’s most expensive rental property. Though Sarah and Matteo moved into their one bedroom apartment as a couple, they didn’t hold any particular reservations about welcoming a daughter into the space. Even Sarah, who hails from Texas where they are not exactly famous for doing things on the small, was optimistic. Neighbors in the building had a child, so they knew it could be done (although they moved out on the day that Sarah and Matteo brought Anna home from the hospital). And the couple liked their apartment, and the safe and scenic neighborhood they had come to enjoy, “I never imagined I would live in the Marina - it wasn’t my scene, but we love it,” Sarah adds. Anna's nursery, in what used to be the closet off the master bedroom. The apartment may only have one bedroom on paper, but they are not lacking a nursery. It comes in the form of a large walk-in-closet off the master bedroom, “My mom helped decorate - it’s a legit nursery. It makes it feel like we have a 2 bedroom apartment,” says Sarah. The converted nursery now fits Anna’s full size crib, changing table and clothes, with shelf space to store books, toys and other household items. Down the hall in the bathroom, the family are a little more conscious of space. The proportions of the room are slightly awkward for Anna’s bath-time. Sarah and Matteo solve this by positioning a laundry basket down the accessible end of the bathtub, creating a smaller bath zone to keep Anna from sliding out of reach. In the kitchen, a clip-on high chair sits Anna at the dining table without adding extra clutter, “not only is it a major space-saver, but Anna eats right at the kitchen table with us,” says Sarah. And when your papà is a chef, what goes on at the dining table is not generally something you want to miss out on. In fact, while I visit Matteo prepares a simple snack for Anna that is presented so beautifully it could be mistaken for a restaurant starter. Anna's Chicco 360 high chair saves some valuable real estate at meal times. If our parents and grandparents generations of babies slept in drawers, this generation sleeps in wardrobes. Lilias is one of many of the San Francisco babies who boasts a cozy little crib where the vacuum used to be. Wardrobe conversions are dotted all over the city. In fact, they are considered something of a luxury in this squeezed rental market, allowing apartments intended for one to moonlight as family homes. The door to Lilias' sweet little room; what was once the living room closet. In the Hewitt’s case, the wardrobe nursery is not just convenient and space saving, it’s also adorable. Anna and Oliver teamed practical elements like the smallest model of Ikea crib, drawers and changing pad, along with some sweet personal touches such as ceramic drawer handles, a mobile and a homemade rug - both designed by friends. And they’re happy with the result, “It works really well. Lilias doesn’t need a bigger room at this age, plus we don’t need a baby monitor - we just leave the doors open,” said Anna. Evidently their little urban babe is similarly impressed with her new room, sleeping through the first night she spent there. “For the first two months, Lilias slept in a moses basket at the foot of our bed, but it works much better now she is in her own room,” said Anna. With Lilias now five and a half months old, the Hewitt’s apartment has not yet been introduced to the wandering destruction of a mobile child. In this stationary phase of babyhood, the play-gym and bouncer are a big deal. In this case, both are light, pleasant to look at, and easy to move between rooms. Anna and Oliver have optimized the kitchen in small but significant ways. They introduced a wooden cart to increase storage and bench area. While more of an aesthetic change came from removing the cupboard doors, “to create a feeling of space and display of our jars of food,” said Anna. The couple enjoy spending time in the kitchen; Anna has her own food blog, and Lilias likes to watch from the bouncer as her parents concoct goodies. The sights and smells must have been inspiring as the littlest Hewitt is showing an early interest in food - already eating three solids meals a day in her high chair. Across the hall in the bathroom, Anna and Oliver are big fans of their Boon tub. It collapses to become almost flat and hangs on the towel rail. With the baby bath out of the way, they have a little space for a chair that is dear to them. It's crafted from wood selvaged from homes damaged in the Christchurch (New Zealand) earthquake, where Oliver hails from. They also squeeze in the rather more utilitarian item of a bucket to hand wash stains out of bibs and onesies. The Boon tub collapses flat for storage. Though the space works brilliantly for the family of three, there have been challenges. Anna and Oliver had some initial reservations regarding the climb up to their apartment “we go out adventuring at least twice a day, so lugging the stroller and a baby up and down the stairs (nine flights) can be tiring,” said Anna. They have made it work with a an umbrella stroller, and their indispensable Becco carrier, “it has also been a lifesaver as it means I can have my hands free to do things like the grocery shopping with her,” Anna added. There is no laundry in the Hewitts' building, so washing must be transported down the stairs and out to the nearest laundromat a couple of times a week. The good still outweighs the bad for the Hewitts. Their space is light, airy and feels like home, but it's the central location and view over the city that really makes it hard to beat. 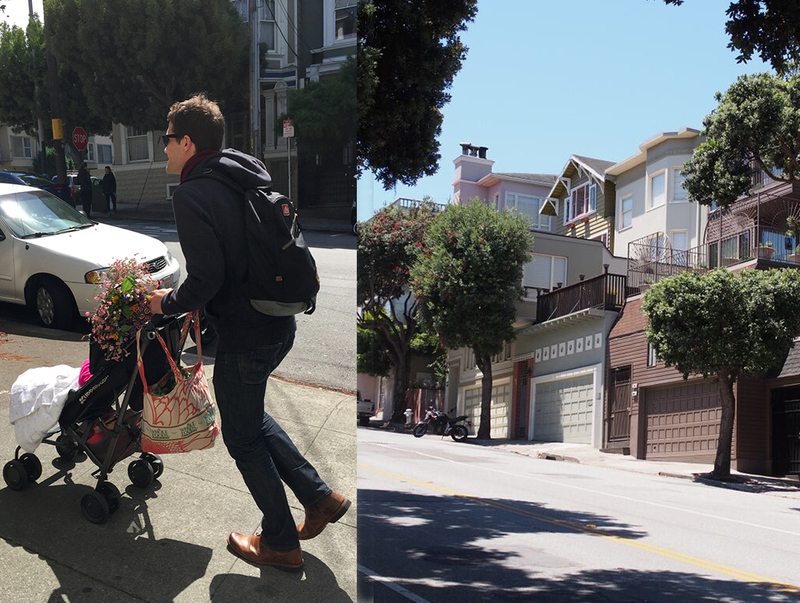 Walkability is excellent, a seriously important factor when you have a small baby and no car, “we are ten minutes walk from the Panhandle, Alamo Square, Duboce Park and Buena Vista Park, meaning that I can take Lilias on nice walks every day,” said Anna. Once entering the Valencia Julian family home, it quickly becomes apparent that the internal space is as much as an influence on day-to-day life as the external. Given that Paulina is a yoga teacher, it follows that her daily practice translates into the considered use of her physical surroundings. Paulina and her husband Daniel moved to San Francisco from Mexico four years ago. When the couple welcomed baby Matías three years later, they made some modest and thoughtful transformations to their space. Amongst the organization and ‘paring back’ of living in a one bedroom apartment, we find a mindfulness and calm that creates their home. The apartment mainly consists of one large elongated room featuring the kitchen and dining at one end, with the living area opening out on to the garden patio at the other. While the bedroom and bathroom are small offshoots off this space. After Matías was born, Paulina and Daniel took out more out than they added in. They were surprisingly relaxed about the prospect of living in a one bedroom with a baby, “we thought - cool, we'll cozy up to balance out the chilly weather,” said Paulina. 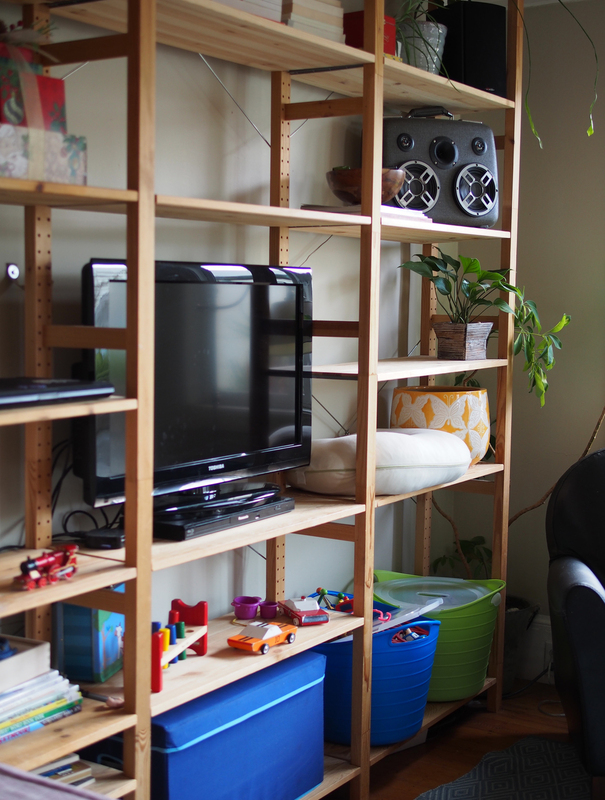 The couple created space where needed, and avoided buying too much baby equipment. “There is always the potential of accumulating more and more ‘essentials’ for baby. We need to constantly assess if buying extra baby stuff is truly necessary,” she added. Bedroom: Move the bed against the wall. Take out night tables, lamps, and extra accessories. Add a crib. Living Room: As the baby becomes mobile: take out extra furniture like bookshelves, stools and tables. Create space for crawling. Living Room: Take out the coffee table. Replace it with a rocking chair. Kitchen: Take away clutter. Add some baby supplies like a food processor, sippy cups, tiny spoons, and colorful dishes. Add a high chair to the dining table. Bathroom: Clear out any excess. Add in a baby bathtub, lots of coconut oil and an extra baby towel. Storage: Add an extra dresser to balance out the lack of closet space. Create some storage space for baby clothes and other items. Matias' Ikea crib, positioned beside the bed. Although the Valencia Julians have managed to be creative and maintain their home in a way that they enjoy. They also have a crawler. This means that order is not always achievable, what was once tidied away can become strewn on the carpet in seconds. They acknowledge that this has been one of the challenges of living in this apartment with a baby, “I've had to embrace chaos as part of my life and relax my sense of control. Great yoga practice for me,” Paulina added. For those with a baby on the way, the couple advise to pause before buying too much stuff, “simplify by getting as few things as you need. Then wait until you have your baby to decide what you really need,” said Paulina. As Matías has grown, they have been conscious to stay ahead of the clutter by constantly reassessing what is necessary, “always keep things moving by giving away baby clothes when they no longer fit, and toys when they no longer interest your baby,” Paulina adds. The act of giving has been key part of this philosophy for this family, by keeping them connected and building community. The very compact Mountain Buggy high-chair saves space while allowing Matias to join the family at the table. The family is due to return to Mexico shortly, and with the move they will be bidding goodbye to their current lifestyle. They have a lot to look forward to, including space for Matías to have his own room, for guests to stay, and even for a small yoga studio. However there are many aspects that they will miss about their little home: “that it is ninety percent made up of gifts from friends and from the streets of San Francisco, that it has taught me the simplicity and creativity of living in a tiny space, that it is close to wonderful parks and public transportation, that it is filled with yoga and meditation energy, and that it marks an amazing chapter in our lives,” said Paulina. The climb up to the Rubin-Davis’ house is not for wimps. Yes, hills are a familiar part of the landscape, but this family might live up one of San Francisco’s steepest. And then there are the stairs. Ariel and Steve complete this climb with Rosie, their 14-month-old daughter, in her stroller or carrier at least once a day. Ariel is a musician and creative, while Steve works in tech. Their home is high aloft San Francisco, opening up views to the East Bay. A sweet two bedroom with a small yard out back where Ariel grows giant zucchinis. The family of three moved here just six months ago. In Boston they lived in an apartment twice the size and paid half the rent. Moving to San Francisco meant some creativity with their new space was necessary. In the living room, Ariel installed shelving “I got industrial shelving brackets and sanded back some quality pieces of pine from the hardware store.” The lower levels neatly house Rosie’s toys in baskets so that everything within reach of little fingers is fair game. While the upper levels are home to books, art and the television. Once again in the kitchen, wall space has been thoughtfully capitalized on to store knives, pots and pans. Floor space on the other hand is minimal, so their eating zone is set up in the living area. “The living room is a pretty decent size, but to be able to fit a table and chairs in the living area felt a little challenging,” said Ariel. A paired down version of a dining set-up worked for them “We chose a small table and just two chairs, and the table can fold down,” added Ariel. While Rosie’s high chair is moved between rooms as needed. Across the apartment’s two bedrooms, Ariel worked to maximize storage by moving their clothes out of the closets. In the master bedroom she used a freestanding clothing rack, “we put our nicer looking and more often worn clothes on it and rotate them seasonally,” she said. While in Rosie’s room, Ariel removed the closet poles and mounted them to the wall. This allowed her to add shelving and create storage space in the newly free closet. Rosie’s crib was also selected with apartment living in mind. It converted from a smaller bassinet to full-size, but has a smaller footprint than a standard sized crib. It’s a popular model with apartment dwellers; a Craigslist find that Ariel snapped up while they were still in Boston. Though the bedrooms are a good size for a small place, sound transparency is another challenge. Rosie’s room is off the main bathroom and the kitchen, which makes it difficult for Ariel and Steve to entertain, “noise seems to wake her up a lot more easily in this apartment,” said Ariel. “So we don’t have people over as much. And when we do, we have to keep our noise down, keep the doors closed, and put rolled up towels under the doors,” she added. This noise factor also limits Ariel’s music in some ways. It makes it difficult for her to play, to work on new songs, or even just to have the head-space to do either. Not only a challenge that results from living in a small apartment, but also from being a parent. Mark is a software engineer and Rachel is a freelance writer and stay-at-home mom. We live in San Francisco with our one-year-old daughter, Penelope. Did you ever imagine that you would live here with a child one day? No. It was small but worked perfectly when we lived here as a couple. Now that we have a baby it is even smaller and works somewhat less perfectly. Mark and Penelope in the kitchen. What has been surprising about living in a small space with your child? Originally when we decided to stay put while I was pregnant we thought we would need to move out at around six months, or when ‘the baby’ became mobile. Our neighbours in this building couldn't believe that we could even fit a newborn in one of these apartments. Now our daughter is one year old and we are still here. It is surprisingly doable to live in a small space with a baby, we're feeling a little more squeezed these days, but I can see it being an acceptable option for toddler years if we need to stay put. Describe your biggest challenge so far. One of the more difficult aspects has been both sharing our bedroom with Penelope, and her sharing her room with us. Before she slept through the night, we woke each other up a lot. Nowadays, she sleeps well, but she wakes up early. So we all start our day at the littlest one's decree, sometimes it's 6am, sometimes it is 5am. In what ways have you altered the space to fit your little one? Penelope’s dresser and changing table moved into the bedroom, while our dresser has moved into the living room. At first this seemed a little awkward, but now it is useful. The dresser/changing table acts as a divider between Penelope's crib and our bed. We have found using the dresser as a changing table works considering the lack of space. The model we used was the IKEA Hemnes, big roomy drawers and sturdy enough to fit a full sized changing pad. Because space is at such a premium, a full sized crib was not an option for us. We settled on a sturdy travel crib and it has worked well for our needs. We also park her stroller in our bedroom. It's a very compact umbrella stroller, but still manages to take up a lot of the remaining space in the room. It is nice to keep her wheels out of our living space though. There are no major changes that we have made to the living room. Clutter creeps in as toys multiply. We try not to buy many toys, but the ones that we do have are divided between a big basket and a cardboard box stowed under the coffee table. The coffee table sports foam edges to protect from falls during these precarious learning to walk months. When Penelope was younger we loved the compact activity gym from IKEA. It looks good and it's small and light enough to move around when you're short on space. Nowadays she's more entertained by balls, things with wheels and blocks. The metal door on our media cabinet has become home to Penelope's magnetic blocks... the ones that aren't collecting dust underneath it that is. The media cabinet turned Tegu block wall. We have a tiny, but functional bathroom in this apartment. We don't have a bath, so a suction hook above our shower stows Penelope's tub. Penelope’s high chair is a Stokke Tripp Trapp. I love that it has a small footprint. Given that it takes a prominent space in our kitchen, I also appreciate that it is nice to look at. In the early months we kept a foldable jumperoo in the kitchen, the smallest (they are generally huge) that we could find. That thing was a godsend whenever we wanted to get something done. These days, distraction takes the shape of a small wooden stool housing Penelope’s ‘kitchen’ items. At the moment there are a couple of shaker eggs, a small cardboard box and some stacking cups, along with other blocks and bits and pieces. She plays with these since she cannot get into the real kitchen cupboards, which to her frustration we keep closed with childproof latches. Although we do give her free reign in the pots and pans cupboard, another favourite of hers. Do you have car parking space? How do you get around? We don't have a car park, but that's ok because we don't have a car. We spend a lot of time in our neighborhood and spots within walking distance. We also use the Muni (San Francisco subway, bus and tram) with Penelope in her carrier or umbrella stroller. What would excite you about living in a bigger home? Giving Penelope her own bedroom would be about as thrilling a prospect as I can imagine. It would be such a luxury to not have to tip-toe into our bed at night so as not to wake her up. At the moment even getting up to go to the toilet in the night is a delicate affair. Also, having more storage space. Good lord that would be useful. We only have one small wardrobe (inside the bedroom) in this apartment. Anything else we need to stow is hidden away under the bed or sofa. It limits the amount of stuff we can live with, which can be a good thing in some ways. How does living in a small space affect your future plans? Living here we are conscious of the limits that this apartment imposes. How long can we live here? Is there an expiration date? We wouldn't want to try to fit two kids into this house, for example. It does affect how we plan for the coming years. Without a doubt location is this apartment’s biggest drawcard. We can be in any of our favourite SF neighborhoods in under twenty minutes and we’re just a couple of blocks away from Duboce park, which has a lovely little playground for the kids. Friends are close by, and there is always something going on when we walk out the door. Also, we’re very well served for shops, cafes and supermarkets. It’s a fantastic area, especially appreciated since we don’t have a car. I also appreciate the fact that Penelope is growing up in this kind of population density. She comes into contact with so many people even when we’re just taking a walk to the supermarket. There are lots of sights and sounds for her to absorb and I think the richness of this day-to-day San Francisco experience is quite special.